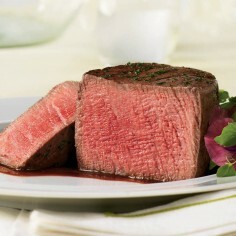 Nothing is more difficult than cooking a good quality filet mignon steak. The secret is cooking the outside enough to not get sick while leaving the inside as tender as possible. For best results preheat the oven to 400 degrees and preheat a pan on the stove on high heat. Season both sides with salt and pepper. When the pan gets pretty hot throw the filets into the pan. The steaks should pretty quickly sear if the pan is hot enough. Maybe 90 seconds to 2 minutes. Flip the steaks and leave them in the pan for an additional 90 seconds to 2 minutes. When flipping the steaks be sure to use a spatula to flip it and not a fork. The fork will allow the juices to escape and it will dry out more than you would want. At that point put the filets in the oven at 400 degrees. How long you leave the steaks in the oven on each side depends on how thick the steaks are. If they are pretty thin then I only put them in for 3 minutes per side, but if they are thick then they get 6 minutes or more per side. The best way to tell if the steak if done is to press the steak with a butter knife. If it returns to its normal shape quickly then it is fully cooked, if not it needs more time. Nothing beats a good steak! I’ve never tried cooking it in the oven before!